Christine Rice grew up in a small Northeast Ohio farming community, cultivating her love of food and photography through the local 4-H Club. Encouraged by her father, Rice decided to enroll at Ohio University to study commercial photography. But she was unsure how to get her career off the ground after earning her degree. “No one told me how challenging the job market would be,” she said. After graduation, Rice and her sister moved to Vail, Colorado. Rice honed her photography skills while working as a barista and a front desk manager for a spa. While Rice never planned to end up in Cleveland, that’s where her journey took her. “I interned with photographer Jeff Sciortino in Chicago during my college years, so that is was where I originally intended to go,” she said. After six months back in Ohio, a friend offered Rice an interview at Kalman & Pabst Photo Group. The food stylists Rice worked with urged her to go to culinary school to learn the science behind the food. But she still had student loans to pay, so a major culinary institute was out of the question. Instead, Rice chose to enroll in the Hospitality Management program at Tri-C. She studied culinary arts and restaurant management while pursuing her new occupation as a food stylist and photographer. After graduating in fall 2016, Rice worked as a food stylist for JACK Cleveland, Vitamix, Ohio Magazine, Cleveland Magazine and Quaker Steak & Lube. 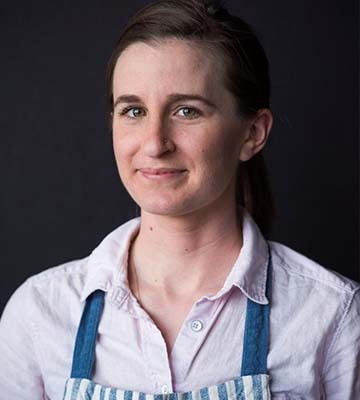 In early 2018, she accepted a job with Hestan Cue in Napa, California, where she works alongside Bocuse d’Or Silver Medalist Philip Tessier. “Tri-C changed my life,” Rice said. “Working as a photo assistant was fun, but working with food has truly engaged me. It is challenging and has driven me to take the next step in my life.